Life In A House of Blue ! : I've Been Tagged ! Home > I've Been Tagged ! 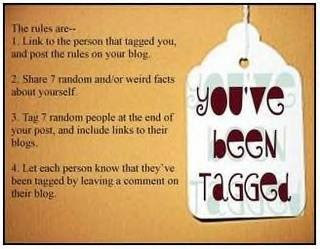 Samantha over at http://samanthaanderson.blogspot.com/ Tagged me so I am passing it on. I drink a 2 liter of coke a day. I took dancing for 13 years and taught for 2. I like to saltwater fish. I modeled when I was in High School. My youngest sibling is a year and a half older than my oldest son. I am a mom to 3 boys 13, 9 and 23mths. You tag me, I tag you. HA! Come get it.